There are days when I dream of sun-ripened fruit and farmstand veggies and other fresh things. And then there are days when I try to Nutella everything. I’ve gotten into the habit of baking off loaves of peasant bread and schmearing warm slices with Nutella, or rescuing day-old peasant bread by toasting it and schmearing it with Nutella. It’s been my daily afternoon treat and I think it was saving me from the depths of everyone else’s winter depression. When we ran out of the sweet stuff over the weekend, we took advantage of the current thaw and took a walk up to one of our many local European markets (one of the great things about living in a Greek neighborhood) to see if they were selling it any cheaper than the supermarket on the corner. They weren’t, but they did have giant jars. Don’t worry, I said, I’ll find a use for it. But when I say “Nutella everything” I don’t just mean a schmear on things here and there — I’m talking about recreating Nutella in all kinds of food forms. 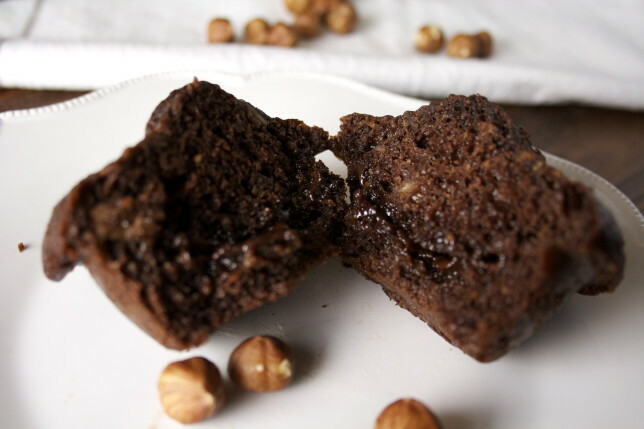 Enter these chocolate-hazelnut banana muffins. Note: these aren’t made with Nutella as their base. They truly are chocolate and hazelnut muffins, through and through — but with a little puddle of Nutella in the center for a secret treat. 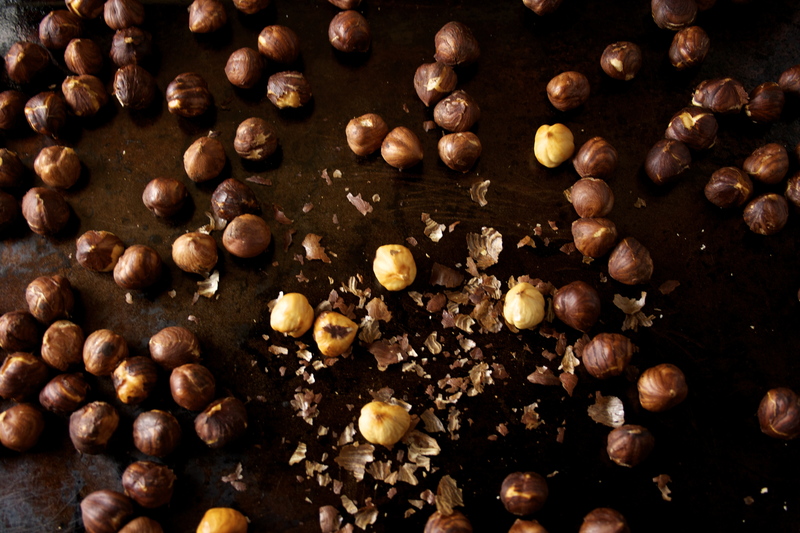 Hazelnuts are toasted, peeled, and ground to a meal along with flour, leaveners, and salt, whisked with cocoa powder, and then mixed into wet ingredients, which just happen to include hazelnut oil. You can definitely go with a more neutral oil, like canola, but the hazelnut oil just takes it above and beyond. I am, for once, really happy to say that these are a true breakfast muffin. Not too sweet, not too decadent. This is the sort of chocolate muffin that puts the “cupcake vs. muffin” debate to rest. Perfect early in the morning with a cup of coffee. The texture is just lovely owing to the slightly stubby consistency of the hazelnut flour, yet it’s still incredibly moist and tender. The dollop of Nutella in the center, while not necessary, begins to ooze into the rest of the muffin, highlighting its sweet nature, especially the morning after baking. And they’re peppered throughout with small bites of banana to recreate that perfect Parisian combination (and add another layer of healthfulness). They are, in a word, absolutely delicious, but without the guilt. I’m pretty damn proud of this creation. So ladies and gentlemen, boys and girls, persons of the future, the muffin has truly been Nutella’d. And the future — your tomorrow morning — has never looked brighter. You’re probably wondering why I didn’t just go all the way and make these gluten-free. The reason is simple: my gluten-free flours are just too old and I’m in dire need of re-stocking. You can certainly swap out the all-purpose flour for a ready-made gluten-free all-purpose blend, or you can try this: 98 grams brown rice flour, 42 grams potato starch, and 2 teaspoons of baking powder instead of 1. 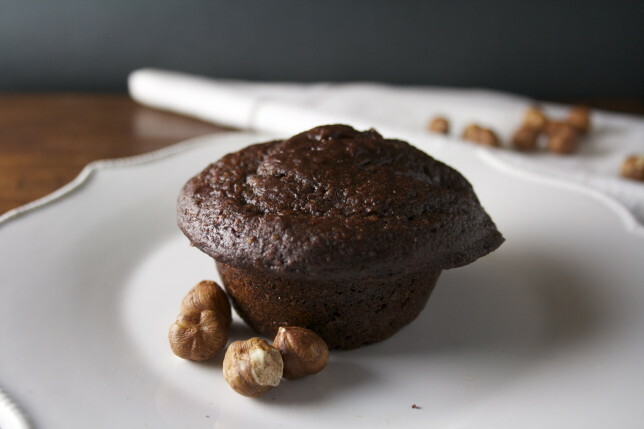 I’ve had luck with that combination in the past, when making Martha Rose Shulman’s Gluten-Free Banana Chocolate Muffins, which were my inspiration for the ratio of nut flour to all-purpose flour to cocoa for these. These muffins keep well in an airtight container or zippered bag, and are delicious at room temperature the following day. If you’d prefer them warm or with a crustier top after they’ve been stored, heat them in a 300 degree oven for 10 minutes. Preheat oven to 375 degrees with a rack in the center position. Spray a 12-cup muffin tin with nonstick spray. Spread hazelnuts on a rimmed baking sheet and toast for 12-15 minutes, shaking the pan once or twice. Remove sheet from the oven and let cool. When the hazelnuts are cool enough to handle, remove the skins either by rolling them between the folds of a kitchen towel or rolling them, a few at a time, in between your palms (I chose the latter, which left my skin soft and smooth!). Place skinned hazelnuts in a food processor along with the flour, baking powder, baking soda, and salt, and pulse until the hazelnuts are fine, taking care not to over-process (15-20 pulses). 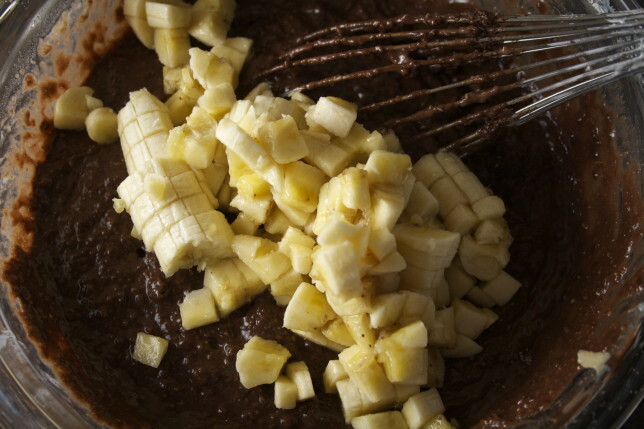 Pour into a medium bowl and add cocoa powder. Whisk well to combine. 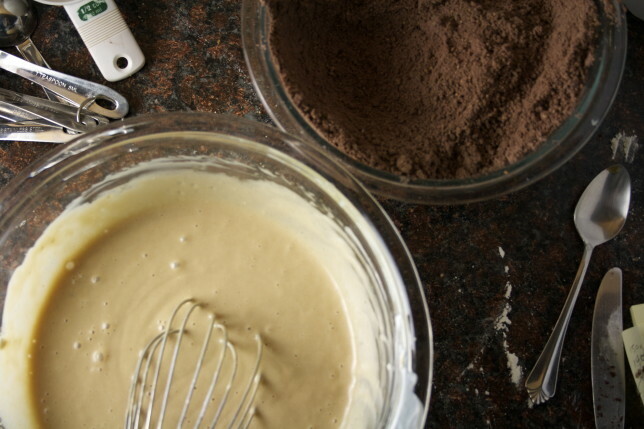 In a large bowl, whisk together oil, brown sugar, and granulated sugar until smooth. Whisk in eggs, then whisk in yogurt, milk, and vanilla. Using a gentle, round, sweeping motion from the bottom of the bowl to the top, add half of the hazelnut mixture, tapping your whisk gently on the side of your bowl to release any clumps. 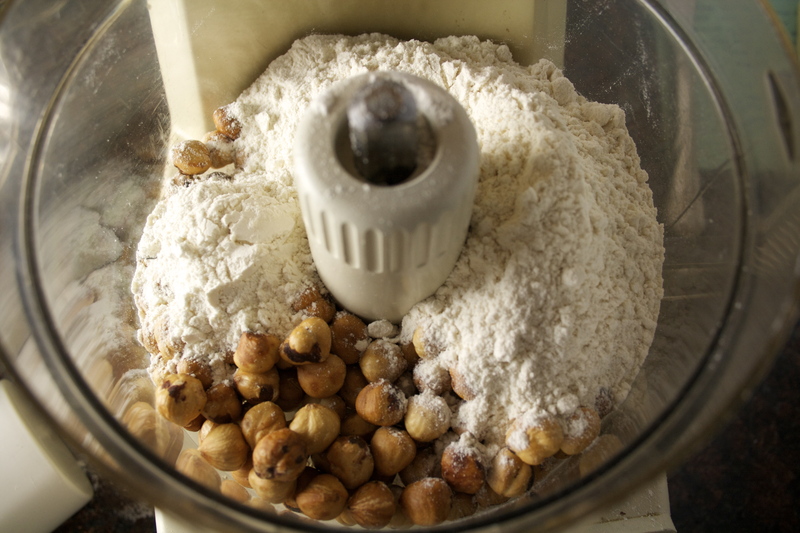 Repeat with the second half of hazelnut mixture until no streaks of flour remain. Very gently fold in bananas. 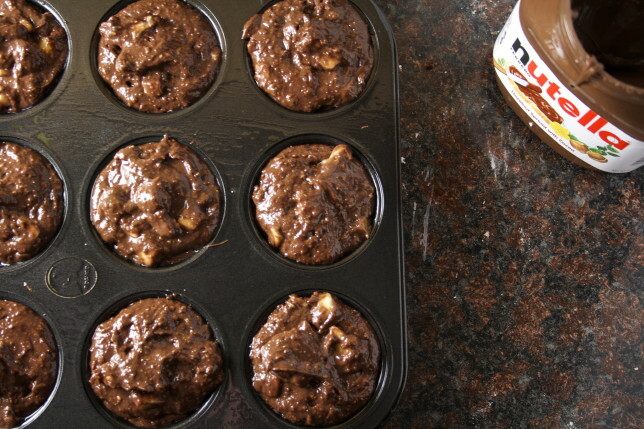 Pour about a quarter of a cup of batter into each muffin cup, or until they’re about halfway full. Next, place 1 teaspoon of Nutella over that bottom layer of batter in each cup, then pour another quarter cup of batter or so over that. They will be completely full and mounded at the center. 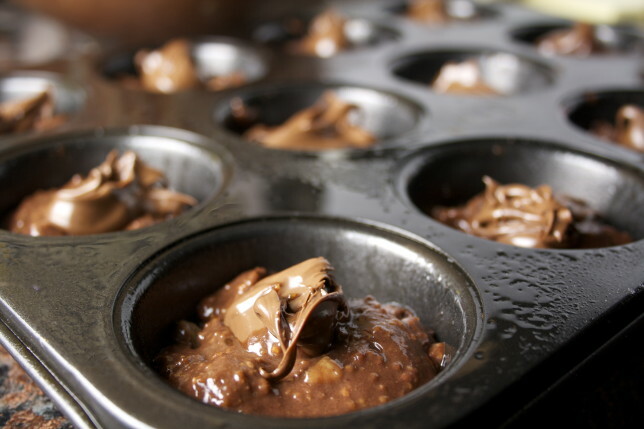 Place the muffin tin in the oven and increase the oven temperature to 400 degrees. Bake for 20 minutes, or until a toothpick inserted into the center of one of the muffins comes out clean. 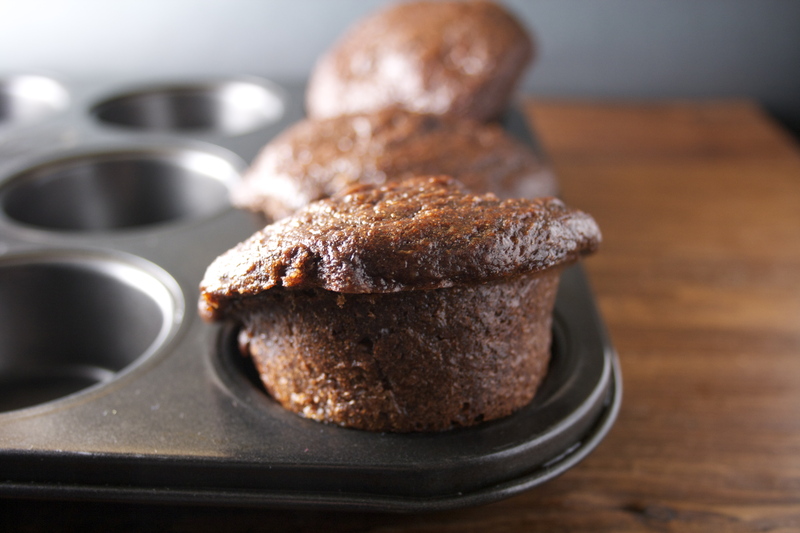 Let them cool in the muffin tin for about 10 minutes before removing muffins to a cooling rack. Enjoy warm or at room temperature. I made these muffins and they turned out so delicious, moist, and satisfying—I’ve been eating one every single day. I absent-mindedly used a 1/2 cup of cocoa powder instead of 1/3, but to no detriment. There’s so much lovely texture in these, from the ground-up hazelnuts, banana, and Nutella; I like that they’re not overly sweet; and the aroma of toasting hazelnuts from my oven was an excellent bonus. Wonderful recipe! So glad you liked them! And good to know the extra cocoa powder had no ill effect — I was wondering how it would be with more, in fact. Hurray! These sound so good- I made a coffee/chocolate/banana muffin with chopped banana a couple weeks ago and I loved how moist the diced banana was. Added this to my way too long list of bookmarked recipes, and I can’t wait to try it out! Yum, the coffee combination sounds amazing in muffin form!